This post is part of a sponsored campaign with Gerber® and MomSelect. All thoughts and opinions are my own. I am a mother of three. Therefore, I have gone through the "fourth trimester" three times and let me tell you firsthand....it isn't pretty many days. Yes, your baby is so precious. Yes, your baby is so cute. Yes, you wish you had more sleep. SLEEP is on the minds of moms of babies EVERYWHERE! That's because sleep is one of the many things that keeps babies and their mommies happy. Sleep helps give babies energy and puts them in the mood to learn, explore and enjoy their day as they go through an exciting time of growth and development. For me, my Formula for Happiness™ was going to bed early at night in those first weeks after baby's birth and letting my husband rock and play with the baby for a couple hours until the baby was ready for bed. My husband loved the bonding time he got with the baby and I loved the extra sleep I got before I had to get up for another feeding! It helped me stay rested and get through those long sleepless nights and days after baby is born! Gerber® Good Start® Gentle believes that the Formula for Happiness™ can be a lot of things, and moms have different ways of enjoying the journey through motherhood. That journey isn't always perfect, but getting support every step of the way helps. Those first couple months are EXHAUSTING and you can start to feel out of control and lost when it comes to your baby's sleep! That is why Gerber® Good Start® Gentle is happy to introduce a Certified Sleep Consultant, Christina Gantcher, who has partnered with Gerber® Good Start Gentle to support expecting and new parents by providing free personal 1-on-1 baby sleep consultations by phone. 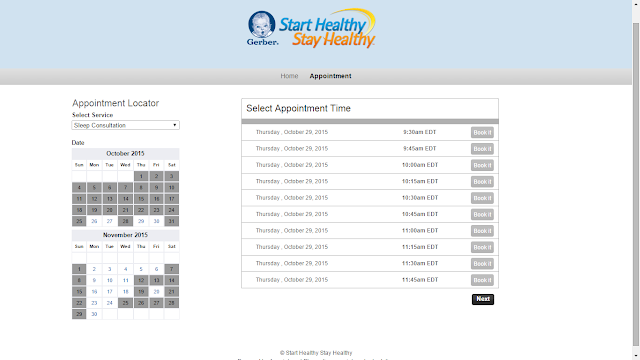 It is so easy to schedule your 15 minute appointment with a sleep consultant! It literally takes seconds to schedule and it could save your sanity and your baby's sleep! Just visit Gerber.com/experts to find the online scheduler to sign up or call the Gerber Parents Resource Center 24/7 at 1-800-284-9488 and they can help schedule your appointment. Until your free consultation, check out these great sleep tips from Christina Gantcher, Certified Sleep Consultant, to get you and your baby a couple extra zzzz's! In working with many moms, it’s clear that when baby doesn’t sleep, it is more challenging for mom to get through her day. As a mom myself, when baby sleeps, everyone sleeps, and a feeling of happiness extends to the entire household. Begin putting your child down while he/she is sleepy but awake, once or twice a week, so he/she can learn how to put him/herself asleep independently. Remember to be patient with yourself and your child. At this young age, babies are extremely malleable and change quickly as they develop. If you’re patient with yourself and your child, you can help your baby learn how to sleep independently. So, if you are yearning for more sleep or really think your baby needs more sleep, but need help or questions answered, YOU ARE NOT ALONE! But help is nearby and it is FREE and you can get this free sleep help easily and quickly from Gerber.com/experts! Do it today and sleep better tomorrow!